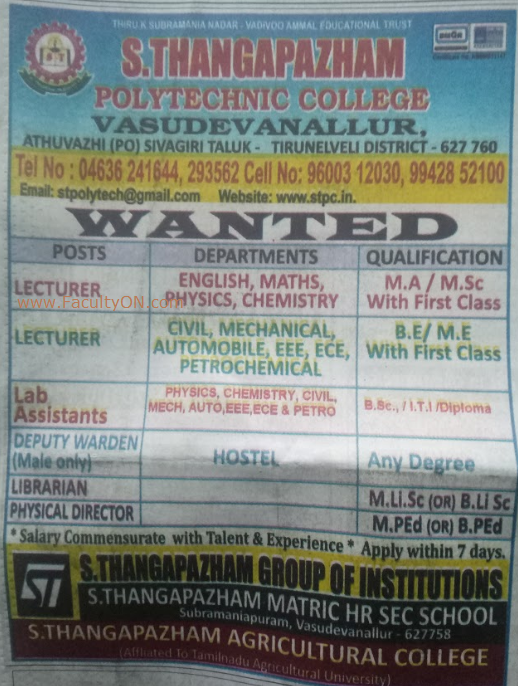 S.Thangapazham Polytechnic College, Vasudevanallur has advertised for recruitment of Professor / Associate Professor / Assistant Professor Plus Trainers jobs vacancies. Interested and eligible job aspirants are requested to apply within 07 days from 25th November 2018. Check out further more details below. About College: S. Thangapazham Polytechnic College was established by the generous and noble philanthrophist, Thiru. S. Thangapazham and his son Thiru S.T. Murugesan, who are well known for their generosity, sincerity and hardwork and who are well experienced in the art of managing educational institutions. They have established this institution with the view of giving quality technical education to the educationally backward people of this area.Further the institution has been established in the honour of Mr. K. Subramania Nadar and Mrs. Vadivooammal parents of Thiru. S. Thangapazham. How to Apply: Interested and eligible candidates are requested to send applications along with their detailed RESUME along with all supporting documents and PP size photo to the postal address provided below.